Here's something fun. The guy on the right is me. 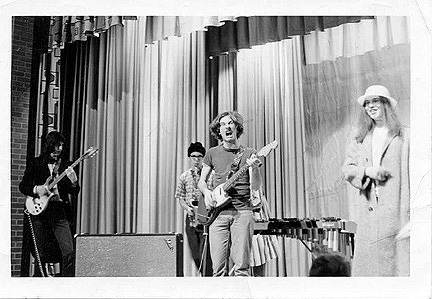 That's my band, Dog Breath playing at the annual talent show at Warren Western Reserve High School. Except for Roland Kirk's "Serenade To A Cuckoo", which we did in the Jethro Tull version and featured me on flute, we played nothing but Zappa material. You gotta remember, this was 1972/73. There were no such things as tribute bands, and we weren't pretending to be the Mothers. All we wanted to play was Zappa, and that's all we did. We had to lift everything off the records, so I can't vouch for the accuracy of the charts, but what we played we played pretty well. We probably did It Can't Happen Here. We didn't do any real gigs, only played at our school, but we did get engaged to play a dance in the gym, and I tell you what, the kids were NOT happy. They just stood there staring up at us. Fortunately we were isolated up on a balcony. No one danced. I think they were waiting for I Wanna Make It With You so the jocks could get in a slow dance with a cheerleader. No such luck, Macho Boy! Ha Ha.